This weekend I was supposed to have most of the book club girls and their fellas and kids here for dinner, but on Thursday I started feeling ill and by Friday morning I was feeling really horrid. I was also told I had to work on the weekend so it all worked out that I cancelled. I felt really bad about it as i was looking forward to seeing everyone but I certainly did not want to pass on my virus. Saturday my daughters and I had an appointment with my Spinologist which is like a chiropractor but with no massage. It’s like the wham bam thank you mam of chiropractors. So we all got our backs cracked and came back home and I logged on. We had a few issues with some last minute client changes but eventually I logged off and got to relax. The kids all stayed home, we built a huge roaring fire, and we watched horror films. I had such a warm feeling of contentment and happiness. Something which I have not had in my own home for so long, it was wonderful to feel it again. Is this linked to the fact that Norm was in and out all week with the Neighborhood Watch? That we have taken away some of crime’s power to frighten us? Or is it just the natural numbing from the passage of time? Whatever the root cause, I am just glad to be feeling back to normal. Today I have made a big pot of beef and vegetable stew and will make some couscous to go with it, Norm bought a fresh loaf today so we are now nesting for the rest of the day. Lucky I only had to work 2 hours today and I am hoping I can persuade Norm to make another fire. Today Lily is off at a conference in PE with her Uni, Josh is at the festival in Stellenbosch and Caitlin Norm and I are going to watch The Pillars of the Earth. I am loving having this cosy family weekend and I am full of gratitude for my warm home, the food in my belly, our health, and my lovely family and the love I have for them all. After all, that is all that matters. This week my friend Retha and I attended the Girl Geek dinner which was held at Restaurant in Wembley Square. I had never been to Wembley Square and certainly not to Sinn’s. I think it is a good test of a restaurants’ skill to see how they cope with catering an event as plating and serving over 100 people must be a huge challenge. The theme of the evening was ‘how to find and secure a job in digital’ and there was a panel of experts to ask questions. One of the fab things about the Girl Geek dinners is the goody bag! 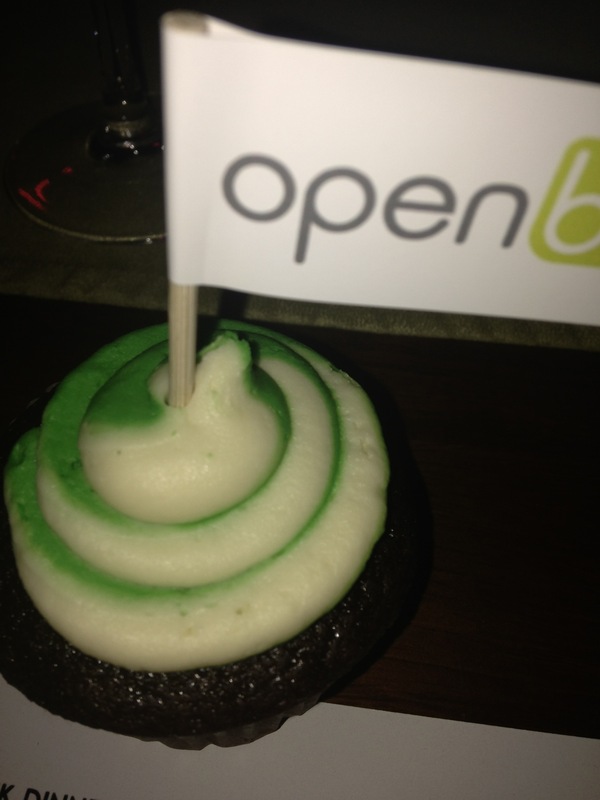 They have some fabulous sponsors and we were greeted with a cupcake on arrival as well as the complimentary glass of wine. I am not sure who sponsored the wine but no one enjoyed the white – it was a sauvignon blanc but was so tart and sharp that even after a few sips my palate could not tolerate it. 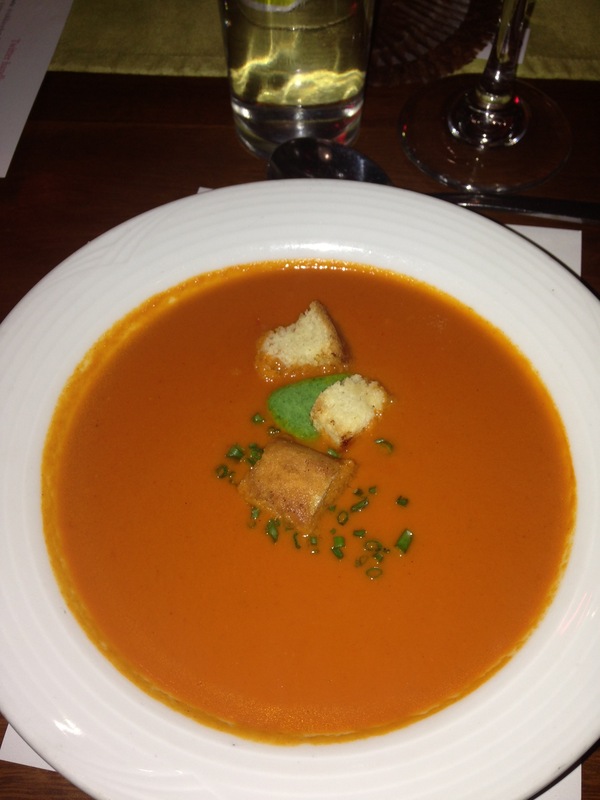 The starter was a choice of a tomato and red pepper soup or a garden salad. As it was bloody freezing that night as well as a bit drizzly out I chose the soup. It was really lovely, full of flavour, a bit heavy on the garlic, but palatable. I would have like a tad more chilli but some of the women found it a bit too spicy so I understand they have to cater for all taste buds. 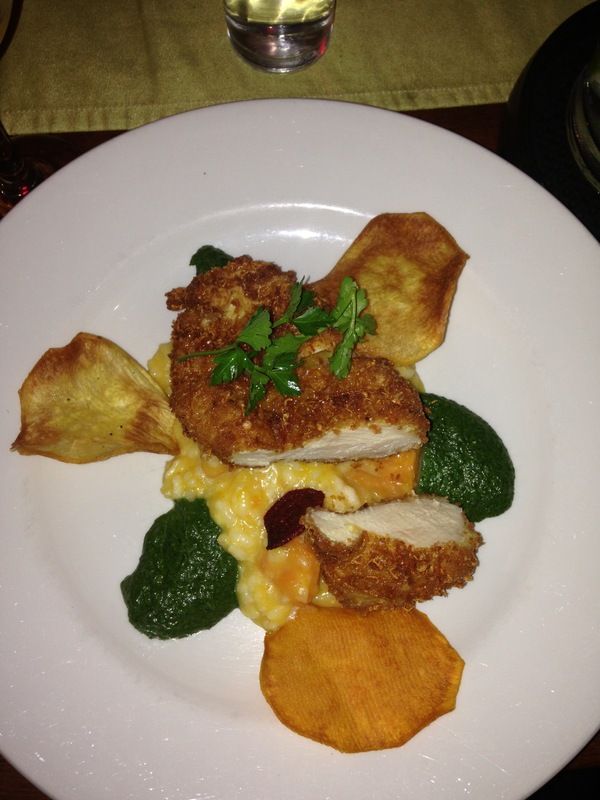 The main course was parmesan chicken on a bed of butternut risotto and creamed spinach. The chicken was crispy on the outside and still juicy on the inside, very nice indeed. The risotto was very flavourful with big chunks of butternut, except my butternut was rock hard so it was shoved off to the side. The creamed spinach was divine. I could have eaten a bowl of just that! All in all I think the main was very good. 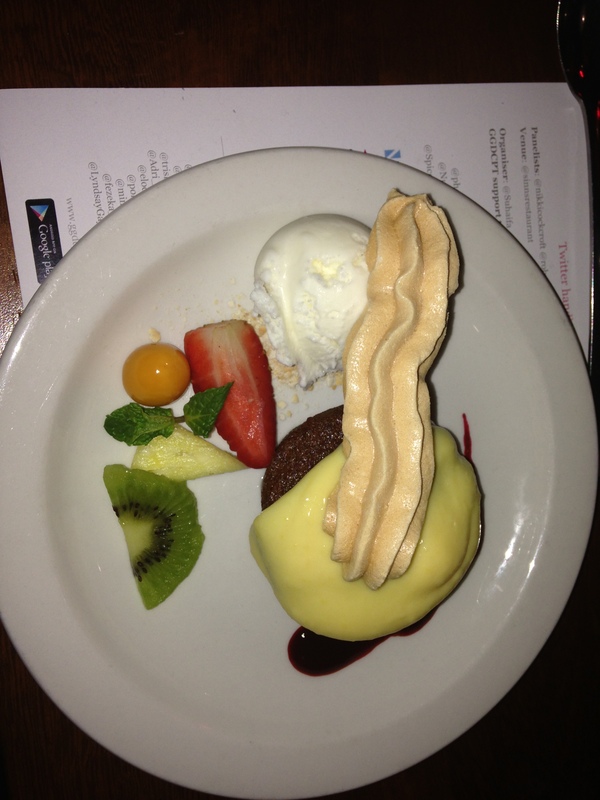 Dessert was described as Sticky Toffee pudding with custard (or was it Malva? I forgot to bring home the menu). 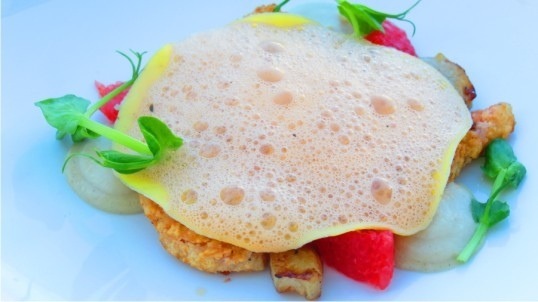 There was a bit of fruit on the plate and a bizarre long thingy which tasted like a macaroon….ish. But it was nice. The next day I had a friend coming through to Hout Bay for a meeting so we made plans to meet up for a cocktail. We went to my usual fave for sushi, the Lookout Deck. I ordered my usual frozen strawberry dacquiri and we started chatting. I always find it interesting how you can find with some people that the conversation just flows, even if you do not know each other that well. Some people I have known for years I still struggle with keeping the conversation flowing as we just have so little in common. Or is it just a soul connection that makes some people feel as if you have known them your whole life? We talked about Brian Weiss and past life regression, hypnotherapy, the present, the past, religion, I think we covered it all! And never in a debate of who is ‘right’ or who is ‘wrong’, just in a sharing of information and belief systems. I think that we have soul sisters – those women we meet and feel instantly drawn to, who always make you laugh, who make us feel valued, and we trust with our secrets. It is not about the amount of time you spend with them, it is the quality of that time. I really enjoyed our little visit and chat, the fact it was accompanied by sushi and cocktails has no bearing at all *wink*. This has been such a fun weekend. Friday night we were invited to a birthday party at Spiro’s, the local Greek restaurant in Hout Bay. We always enjoy going there, the staff always have a smile, the food is reasonably priced and the portions generous. But what makes Spiro’s a success in my opinion is Spiro himself. He is so warm and welcoming and remembers his clientele and bends over backwards to make them happy. We were due at the party at 630 but were running a bit late, then we ended up with everyone coming to our house for a drink. So we arrived rather late to find things in full swing. There was a belly dancer who came and did a bit of a shimmy and about 30 people in attendance. My group alone was 5 people and we ordered some food to line the stomach as I had a feeling it was going to get a bit loose. None of us had actually met any of the people at the party, not even the birthday boy Jim. We all belong to a Hout Bay Facebook group and chat daily, so I was looking forward to meeting them in ‘real life’. It felt like I knew them already and we all chatted nonstop. The wine was flowing and we were in a great mood. Mandi was staying overnight and we booked a taxi so we really let our hair down. Mandi and I had a boogie on the dance floor and even pulled the waiters up to dance with us. We had a blast. About 5 bottles of wine between the 3 of us, topped off by a round of coke-quila. I don’t like coke and I don’t like tequila so why I decided to drink them in one big swallow of shots I don’t know. I blame Mandi, haha. Unfortunately Norm and I paid the price this morning. Oh how dreadful I felt…at my age I don’t have the ability to recover like I used to. I blame my Cherokee heritage, I can’t take the fire water. Something is missing in my genetic make up I am convinced. I had my wax appointment booked so I popped a few panado and put on my big girl pants and off I went. Bad plan. Don’t ever think having your hair ripped out by the roots while your head is throbbing in pain is a good idea. It’s not. But I survived and came home to snuggle up in my bed. Poor Norm spent all day out in the drizzling rain trimming trees. We wanted to clear off all limbs which would provide a hiding place for criminals. 6 carloads of tree bits later, our wall is clearly visible from the house now and it is much safer. Tonight we were invited out with our friends for dinner at La Mouette in Sea Point. This is one of our favourite venues in Cape Town. The decor is beautifully done, it is this little gem in the midst of a busy section of town but when there you feel like you could be off in a country home. The chef Henry is a master at taking what sometime sounds like a bizarre combination of tastes which then always end up as amazingly complimentary. They have ala carte items but we always go for the tasting menu. It is 6 little mini courses and I have never been disappointed. Tonight was no exception. 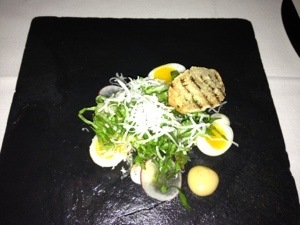 The 1st course was a delicious Caesar salad surrounded by soft Quails eggs, pecorino gel, Caesar dressing, with crispy brioche croutons. 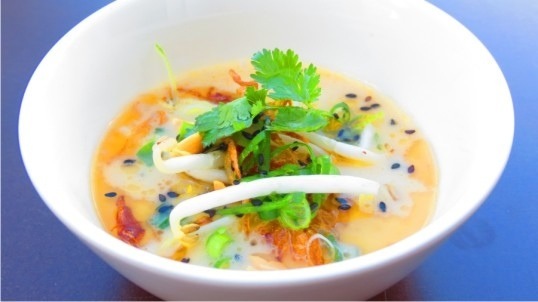 The 2nd was Coconut broth with Vegetable dim sum, crispy onion, peanuts, pickled cucumber, bean sprouts and sesame oil.. The texture of the crispy cucumber, peanuts and veggies, the creamy coconut broth all mixed into a little bowl of heaven. Pic nabbed from La Mouette website as mine was too dark.. The next course you had a choice of either Mushrooms on toast which consisted of French toast, mushroom puree, pickled mushrooms, truffle dressing or Open lasagne of crispy prawn with Pink grape fruit, cauliflower puree, prawn bisque. I opted for the latter and it was sooo divine! I had been wary of the grapefruit as I am not a fan, but the sweet / tartness of the grapefruit lifted the taste of the dish to perfection. This dish was so appealing I wolfed it down without taking a pic, and the waiter brought one from the kitchen for me to snap. He was brilliant. There were 2 choices for the next course as well. For the veggies, there was Winter vegetable tagine served with tabbouleh, smoked aubergine puree, pomegranate, and crispy goats cheese. For the carnivores there was Braised lamb shoulder served with Soft polenta, confit tomato, basil and polenta tuile. I am not a fan of lamb, and I really was torn but the veggie dish just did not appeal at all. I had just the day before swore to a vegan friend that lambs are too cute to gnaw on and less than a day later I was doing just that. Sorry little lambkins but dayum you were tasty. The lamb had been slow cooked and was so tender it could melt in your mouth. The polenta was the creamiest most delicious I have ever eaten, polenta can be so dry and tasteless and this was sheer perfection. The basil was steamed and served like steamed spinach, under the lamb. It had a nice texture. We took a bit of a breather after the main and Mari the owner and wife of the chef sent our table a round of limoncello to cleanse our palates. Lovely. 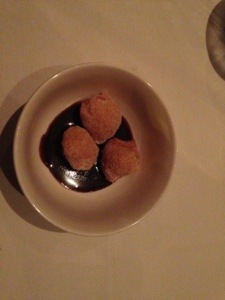 After a bit the 5th course was served, it was 3 bite sized warm doughnuts. Crispy outside, rolled in sugar, and so soft they melted in your mouth, swimming in chocolate sauce. I have never been a fan of passion fruit so i was a bit skeptical about the final course. 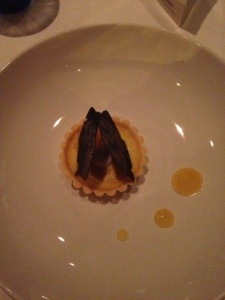 it was a Passion fruit tart with Mandarin caviar, lime leaf and lemon grass cream topped with chocolate leaf. I should know by now that any preconceived ideas I have about taste preferences just go out the window when at La Mouette. It was lovely and creamy and the pastry was perfection, the crispy sheets of rich dark chocolate balanced it brilliantly. We had a brilliant night with lots of laughs. Such a wonderful meal and wonderful friends. I love my life. The last week or so has been challenging. I seesaw between normality and sadness. But one has to keep on keeping on…it is the nature of life. My friends rallied round while Norman was away. Retha came and collected me on my 1st night alone and we went to the harbour for take out sushi from The Lookout Deck (yes again. I like sushi OK?). While there we had my fave – a frozen strawberry daiquiri. We had such a charming and devoted waiter even though we were getting take aways – his name was Tonic and he was indeed a tonic for my mood and had us laughing over our cocktails. We took our goodies back to join Pierre and we watched a film and had a laugh. It was just what I needed and I spent several hours with no tears. I had booked a girls weekend away with the ladies in my bookclub ages ago and even though I was not feeling very sociable I packed up and went. I am so glad I did as we had a brilliant weekend. These ladies always make me laugh, all are brits and that is my sense of humour so we all chattered and giggled like schoolgirls. We went to Aquila Game Farm and we were so lucky on our game drive, we saw elephants, rhinos, zebras, peacocks, buffalo, lions, hippos, ostrich and many types of bucks. 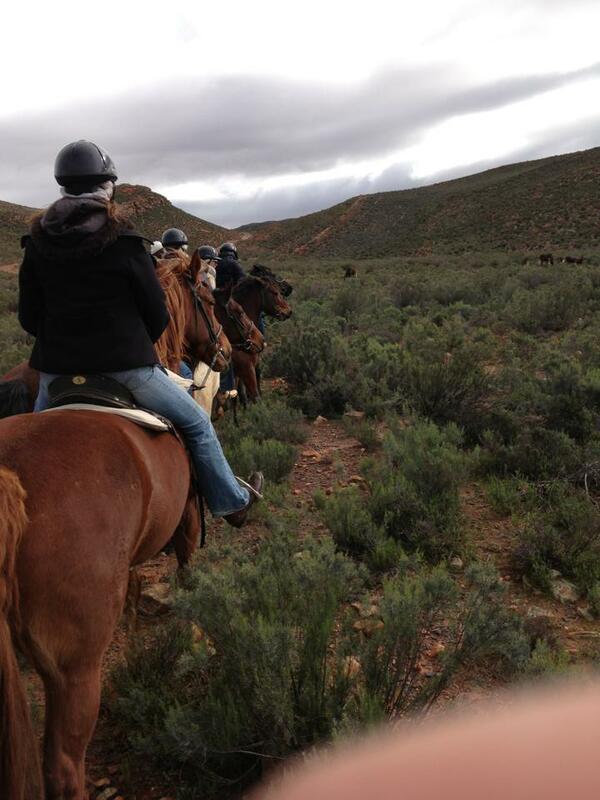 But to me the cherry on top of the whole weekend was our horseback safari. 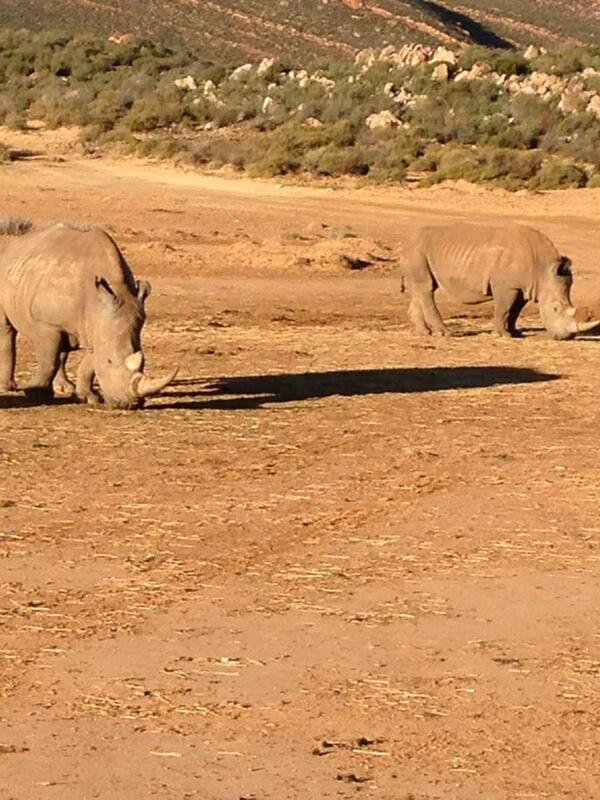 To be on such a majestic beast while riding in the most stunning country looking for animals was just so special. I came home feeling like life was good, and I am blessed. I also came home to Norm and that made life complete. Tonight I am off to a birthday party of someone I have only met online – nothing new there as I am used to that from my twitterati events and other networking events but I am still looking forward to it. There are so many people I chat to who will be there and I look forward to getting to know them in 3D. Enjoy your weekend and count your blessings. The last few weeks have been very stressful for our family. My kids have had such a tough time. First they lost their childhood nanny. She was with them since Lily was a baby. She came into their lives at a point when they needed her and she spent the majority of their lives looking after them until she retired recently. The kids were devoted to her and rang her every Sunday. My step dad Tom has been fighting cancer now for several years. He had so many times where we thought he could not recover, and each time he managed to rally round and keep on going. He fought such a hard battle and I think he only gave up after the scan where they broke it to him that the cancer had spread to his bones, brain and liver. Until then he had kept fighting as he thought he had a chance to beat it. Once he realised that despite all of his optimism, the many hours of chemo and treatment that he was losing the fight, I think he just ran out of energy to keep up the battle. The girls and Josh had intended to stay in George after Jean’s funeral and have a holiday as well as attend their Dad’s 60th birthday. But when we got the call that Tom had passed we started to check for flights. I have no annual leave, sick leave or compassionate leave left from work. I took 3 weeks holiday in December so that was my annual leave. I took over 2 months of sick leave when I had my hip replacement and I took my compassionate leave after our armed break in as I was unable to function, must less work. So I knew I would not be able to go to the USA myself. Luckily the universe was watching out for us again as the girls have a few weeks off of University. I could only afford to send one of them over and as Caitlin had lived with Tom when she was in High School she was the obvious choice. Right up to the night he died Tom remembered Caitlin. He did not remember his own family but he did remember Caitlin. He really loved her like she was his own daughter. When ever she would challenge him, his response would be ‘Not on my watch!’. Which always made me laugh. So even though we are all so full of sadness, I also have to be grateful. I am grateful that my children had so many people to love them. So many children have no one who loves them, no one to parent them or teach them right from wrong. My children were blessed with a Mother and a Father, a wonderful Step father, Jean who was at times their mother, their grandmother and sometimes just a friend, and all of their biological grandparents and Tom, who despite having no biological children turned out to be a brilliant father and grandfather. I am picturing Tom and his mate Bob and maybe even my Dad kicking back having a beer together, out of pain, looking down on all of us, protecting us and still watching our backs.